For some criminals, it isn’t enough to merely break the law. They have to break it in style. It’s a questionable style, however, only to be envied by children. Trick-or-treaters, that is. We don’t know why some criminals opt for full-body costuming, as opposed to the requisite mask, but the ridiculous and amusing list of them is only growing. Over the past few years, we’ve seen Gumby try to rob a convenience store, a banana man disturbing the peace, and a chicken and two gorillas ripping off bicycles. 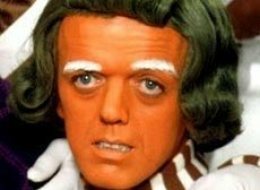 The latest incident in this trend involves two Oompa Loompas attacking a British man. Matthew Wright and Louis Gelinas have been sentenced in a British court for attacking a 28-year-old man while in costume last December, leaving him with cuts and bruises. The two young men previously pled guilty to disturbing the peace at an earlier hearing. Wright received a sentence of 10 months in a young offenders’ institute (that’s “juvie,” American readers), and Gelinas got 240 hours of community service. Normally in cases like this, you have to wonder if the perpetrators were drunk or high to commit the acts they did. This time, though, you have to wonder if it was all the candy.